When you see your beloved pet suffering from an intolerable itch, how can you tell if it’s flea-related or not? It could be that you find some tiny specks on the floor, or maybe that beautiful coat of theirs is beginning to look a little thin. Once your pet has fleas, there’s little possibility the animal won’t show signs. 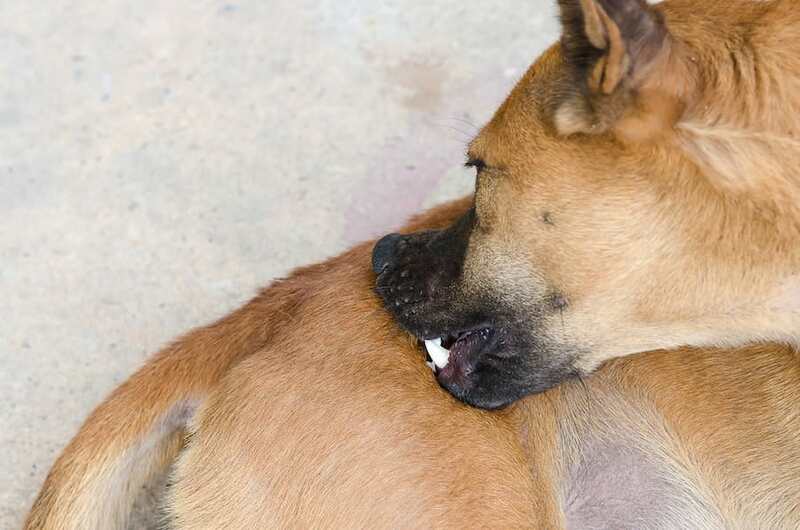 Given fleas attack rapidly, the bites can multiply in a moment’s time. How can we be sure, though? Let’s look at some of those signs now. How Can You Check If Your Pet Has Fleas? Scratching is, of course, a common occurrence for most pets, but even more prevalent when they have fleas. When a flea bites, the insect’s salivary glands emit a substance that causes your pet to be irritated. While some pets don’t suffer from specific sensitivities or allergies, almost all dogs will react to fleas by scratching incessantly. Seeing this trait in cats is also a common sight. With a bad case, there’s a chance your dog or cat will also repeatedly gnaw away at the area with their teeth—furthering their chance of contracting an infection while they’re at it. If your pet is scratching or gnawing at a certain area repeatedly, it would be a good time to check for fleas. Flea dirt is another indication that your pet might have fleas. Similar to flecks of black pepper in appearance, flea dirt is rough in nature and is comparable in size to sand granules. These small black specks are actually particles of flea feces—primarily composed of old blood, sucked up from their recent host. A sure way to find out if those specks are, in fact, flea dirt, is easy. Simply wet a paper towel and gently rub it over the area on your pet where you initially found the flecks. If this brief exercise results in your paper towel having something similar to dirty bloodstains, then your pet most likely has fleas. This trick can also work by looking for flea dirt in your pet’s bedding or in carpet fibers. Fidgeting and more irritability than usual is another sign of a possible flea infestation. This includes your pet sleeping less than usual and an inability to relax. Are they constantly looking for a new position to sit in or area to relax on? If the answer to this question is “yes,” you might want to investigate further. Within 30 minutes, flea bites can leave small red welts or raised spots. These spots are a result of dilated blood capillaries around the bitten area. While the spots themselves are not dangerous by any means, they can lead to wounds or blister-like lesions after about a day or so. This is especially so if they are scratched or irritated by your pet’s teeth. Flea bites are pretty distinctive. Just as they do with animals, they can cause constant irritation and discomfort for human hosts as well. While flea bites are most commonly found around the ankles and legs, they can also be on other areas of the body including knees, elbows, armpits and more. This is especially the case if you’ve been outdoors or in environments where fleas are prevalent. Maybe on a couch or even in the bed, if your pet has been sleeping in these places. Typically though, fleas will only reach the areas they can easily jump to. Hence the bites around the ankles, where the fleas can hop on as you’re walking across the carpet or through the yard. Most stick to around one area of the body, covering a surface area of approximately 1 inch or so. Sometimes the bites are in a straight line or they can appear in a triangle form as well. Aside from your usual itching, you may even experience hives or develop a rash around the site. If at all possible, avoid scratching the bites. Like other insect bites, when one continues scratching, it can lead to white-topped blisters or an infection. Search for cooling creams or a similar product for additional relief. You can also place a simple bandage over the area to help you avoid touching an open wound while it heals. It’s a well-known pet factoid that an animal’s coat is a reflection of their overall health. This can definitely be applied here. What does your pet’s coat say? If your cat or dog is showing up with bald spots here and there, don’t just chalk it up to aging. While it’s normal for your pet to lose hair with aging or the standard shedding, this could be a sign of incessant scratching—even if you haven’t noticed it as such. Bald patches should be a warning sign that something more might be lurking underneath the surface. This is especially the case if your dog or cat has shown signs of allergies in the past, so be on the lookout. One of the signs of parasitic anemia is if your pet has pale gums. Anemia is an unfortunate consequence of fleas—given the amount of blood that can be lost. Due to the fact that fleas can consume over 15 times their own body weight in blood, your animal could lose a lot of blood over a short period of time. Puppies and kittens are particularly susceptible to this factor. Their low number of red blood cells cannot take the onslaught. Pale gums can also be a dangerous factor for your elderly or debilitated companions. They are sometimes unable to manufacture healthy platelets, so at a greater chance for loss of iron. There is some good news, however. Dogs and cats that become anemic, due to a flea infestation, can receive medical treatment to help return them to a healthy state. Aside from the signs listed above, there are several additional ways to check if your pet has fleas. Watch out for yourself in the process, though, so you yourself don’t end up with the pesky insects, too. Comb your pet’s fur. Use your fingers or a fine-toothed flea comb to gently part your pet’s fur, area by area, so you can see directly onto their skin. We recommend starting around the head and moving towards the tail. The crucial areas to watch out for are behind the ears, around the abdominal area, and around the base of the tail, where fleas love to hide out. Hopefully you will be able to see a live flea and confirm an infestation. Be sure to know what a flea looks like compared to other small pests. Use light. Fleas are attracted to light, and while some light traps online consist of detailed contraptions, we recommend a simpler option. It won’t trap the fleas, but it will give you a chance to see if fleas are within the surrounding environment or not. Grab an accessible light, something the size of a small table lamp. Rest the light so it shines directly onto the area your pet most often resides in. Give it a few hours and check back in to see what you find. Use a white surface. Place your pet over a white towel and brush through the fur thoroughly. The brushing will agitate the fleas, causing them to either jump or fall off onto the towel. The fleas should be easy to spot against the color of the towel. You are likely to spot flea dirt on the towel too. There could also be flea eggs, although they will probably not be visible on the light surface. Be careful to avoid fleas jumping from the towel onto your clothing or skin during this process. Like many health complications among both humans and pets, preventative measures can often save us time, money and discomfort in the long run. It’s key to making sure your home environment is kept as flea-free as possible. With that being said, if you have pets, clean your furniture and floors often, using soap water where you can, but also regular vacuuming until the infestation has cleared. Take extra care around the areas your pet tends to frequent. If you have pets that ride in the car, don’t forget to vacuum the interior and check regularly for signs of fleas. Flea collars are also a wonderful tool so ask your veterinarian for a recommendation. They come in all sizes and the cost varies, depending on the type of treatment. Some collars kill fleas, while others simply repel them from the area. For those that repel, you can even find natural collars that don’t include harsh chemicals. Last, but not least, if your pet is often outdoors, you have some extra work to do. Domestic animals aren’t the only ones that carry fleas. In rural areas, the chance of your pet catching fleas increases, thanks to wild animals that may enter your yard when you’re not around. Pay attention to the outside environment and make sure your pet is checked regularly. Given the signs we listed above, checking for fleas couldn’t be easier. When you have fleas in your home, they must be disposed of quickly and efficiently, before the problem grows larger. Now that you’re armed with tips and tricks to combat fleas, you’ll be better prepared next time around.